Improbability is nowadays a paradoxical definition. The improbable presents the unlikely in situations and the unpredictable in events. It introduces and evaluates difference and otherness in the order of things. So improbability is a statistical scenario that presupposes the possibility of failure and detour. The improbable is what is distant from reality through that which can be conceptualized. Thus it is a space of expectation in its implausibility. But the improbable also involves temporality, the time needed to prove it wrong. Indeed, the improbable shares with the probable the same structure of rationalization and anticipation. In fact, both were the modus operandi of modernity, a visionary ability in discerning the evolution of the state-of-affairs until its absolute realization. This ideology was called history and its engine named progress. It is a history in the making that demanded rationality in defining the aims and transparency in configuring the end. Thus, a path to a known future. However, when the future as horizon collapsed in the here-and-now of the present, the capacity of rationalization and anticipation was neutralized. The truth is that modern utopia became increasingly relative and indeterminate. In this sense, the process gained autonomy as the final image got obscured. Post-modernity finally announced the end of the meta-narratives, and the pluralization of worldviews, blurring the future in a kaleidoscopic flux of conflicting programs and projects. On the other hand, the virtualization of almost all spheres of human activity turned reality into a kind of lively dream, disrupting the boundaries between fact and fiction, between phenomenon and representation. If the future is splintered in infinite glimpses without teleological order, reality is now an expanded field crossing the real with imagination. Ultimately, no one knows what tomorrow reserves to humankind or what really is happening in the world. Unpredictability and schizophrenia dissolves the gap between the probable and the improbable. Probability equals improbability. The butterfly effect realized. How could we capture the improbable in such paradoxical situation? What happens if instead we conflate the probable with the improbable? Modern Masterpieces Revisited can be a critical attempt to answer these questions. 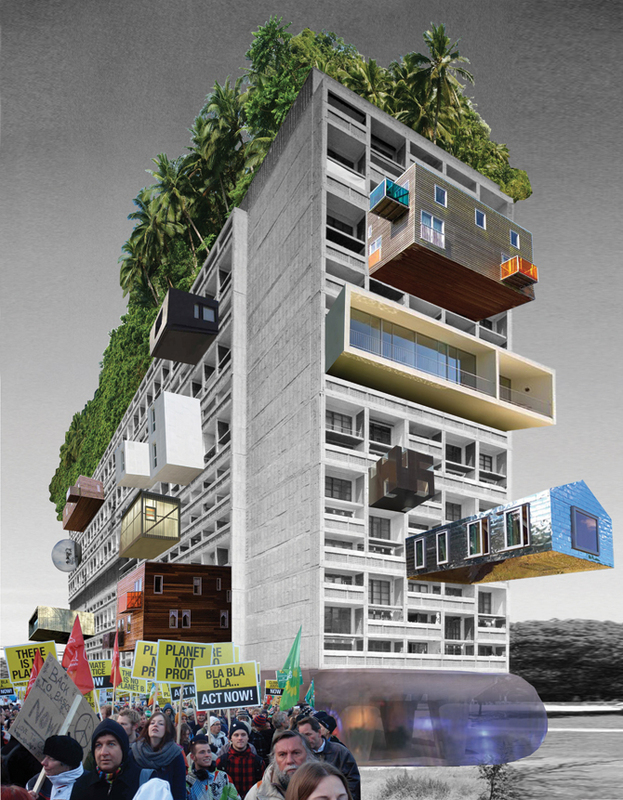 How can we interrogate our current architectural and urban condition in the twilight of theory? The so-called post-ideological and post-critical demand the confluence of fictional and documental strategies of research. The Modern Masterpieces Revisited series explores and exploits the aura of modern architectural objects in this post-ideological and post-critical condition. This comprises singular points of view, critical perspectives and radical scenarios that take iconic modern objects as devices. Something one can capture, for instance, in the out of focus photographs of modern architectural icons by Hiroshi Sugimoto or, more directly, in the Corrupted Classics of modern design by John Angelo Benson, to name two. This research project confronts and conflates the modern masterpieces with both the utopian archive of the discipline and uncontested contemporary realities. Thus the tensions between different times and different spaces altogether dislocate our preconceptions and our value systems. Within this unpredictable process, acts of reinvention, affirmation and transformation, but also resistance, subversion and negation, intentionally cross their boundaries and overlap. At the same time as image and text, a constructed reality emerges neither true nor false, neither good nor bad, neither positive nor negative, neither past nor future, neither visionary nor nostalgic, neither ideal nor real, and only through this conceptually blurred reality can the structural presence of architecture today be truly exposed. Combining compositions of internet-found images and short narrative texts, the project Modern Masterpieces Revisited is an ultimate attempt to confront this critical situation without falling in the modern traps of nostalgia and utopia. Mies van der Rohe made an architectural manifesto for Barcelona. Architecture for architecture’s sake. No institutional expression, no clear function, no boundaries between interior and exterior, just a revolutionary conception of fluid space constructed by horizontal and vertical planes. The work was so groundbreaking that after the early demolition it demanded its faithful reconstruction in the eighties, despite the uncomfortable nostalgia accusations. Significantly, the wall found here its essential manifestation as a continuous, uninterrupted and folded plane. Other walls of the same configuration would mark our history after World War II, walls that divide more than guide our movements and even our thoughts. Architects can separate themselves from crude reality exiled in their historic ivory towers. They protect themselves behind a memorial wall that continues and concludes the previous one. And in the rudeness of this wall the new master architect designed a sublime entrance. 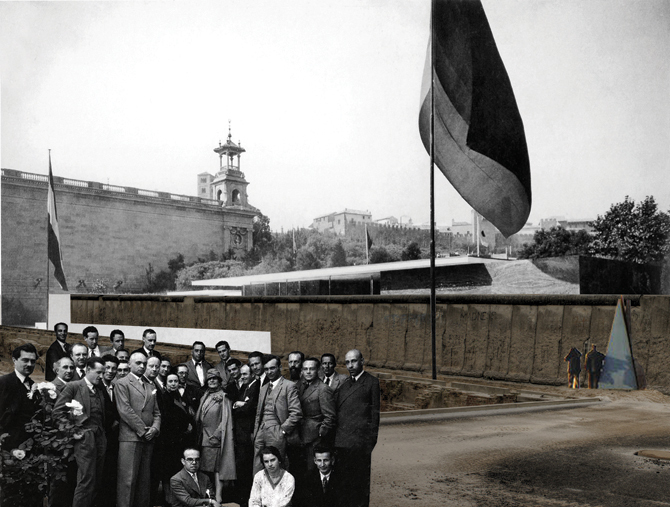 At last, the voluntary prisoners of architecture can start their promised final exodus. Le Corbusier was an architectural revolutionary that firmly believed in a new modern society. While working on the reconfiguration of the urban and architectural models for a new collective life, the architect also made some ideal houses for the bourgeois and industrial elite. These radical houses, built mainly in the outskirts of Paris, affirmed the new possibilities of mechanical mobility that sustained the escape from the busy and crowded city right into the countryside. Modern living could be that pleasant and pacified relation with domesticated nature. But this machine à habiter was only sporadically inhabited and turned into, firstly, an uncomfortable ruin and secondly, a living museum. Today, new virtual conditions of communication and mobility can recover the productive potential of this singular house. Contrary to the previous modern era, new technologies now promise stasis and the grounding in one place for living, working, recreation, etc. Thus, dwelling can recover its ancient holistic perspective. And taking into account the current global crisis, the iconic house can even recover its lost utopian ferment. Mies van der Rohe built the ultimate modern house. A house so perfect that it was almost uninhabitable. A design maison domino made of a simple raised structure, composed only of some pilotis and slabs, sheltering a pure glass house. Inside, dwelling became the ancestral experience of the sublime spectacle of nature. Spring, summer, autumn and winter finally could be visually experienced in the comfort of the interior home. The truth is that this ideal modern house remained empty, awaiting a new man to reclaim it. The sixties announced this free individual, the emergent nomad. This eternal wanderer would stroll along the visionary architectural megastructures that will connect the global world, constantly building anew an ever-changing environment. Now it is time to fulfil the unrealized promises. 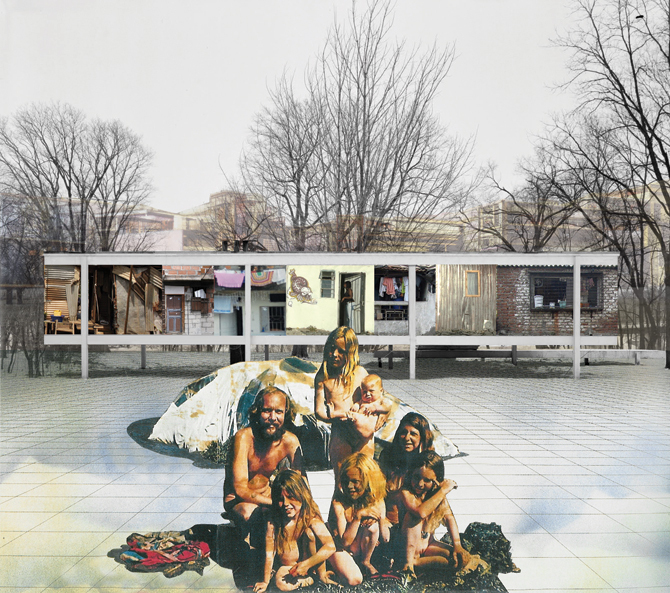 The new rurban dwellers, the homo otiosus that follows homo ludens and homo faber, appropriate the once dysfunctional structure, making it their own. Who really needs glass when the outside, the magnificent new mixture of dilapidated nature and low technology, is only a few steps away. 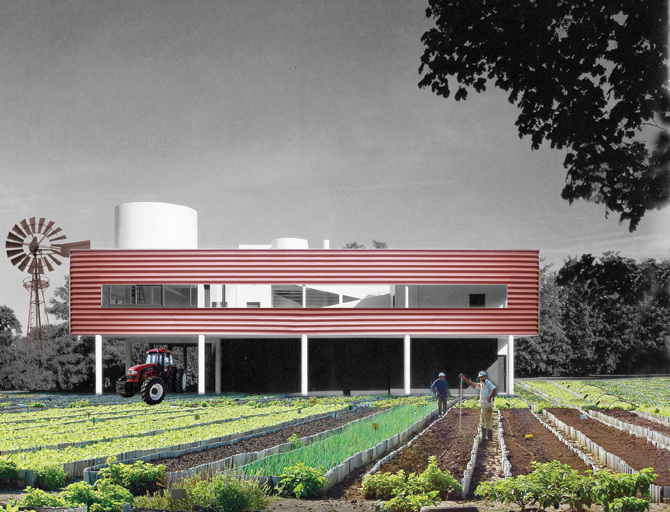 Le Corbusier formalized the idea of modern community, a heroic paquebot in a sea of greenery. This collective house expressed order in an unconventional way. The redesigned social condenser gathered individual cells, the celebrated duplexes, and a series of commercial, educational and re-creative equipments, strategically placed in the tridimensional framework, from ground to terrace. But despite the programmatic obviousness, the sequential materializations of this building model were to be progressively ripped off some of its collective functions in favor of more private cells. Nevertheless, the unite d’habitation has not lost its presentness. It simply needs some makeover that reflects the protests of a demanding society. The tight individual cells can expand to the outside, revealing their owners personality and animating the rational façades. The undetermined modern ground floor can accommodate new collective life, inside an inflatable structure. The toit jardin can meet the promise of a luxurious and exotic green terrace, turning its vacant equipments into mysterious Aztec ruins. Wright abhorred the metropolis. He said it not only with words, but essentially by a strange building. The Guggenheim was the very opposite of a metropolitan architecture: small, short, low, round and closed. In the middle of the forest of slim and high skyscrapers, the new museum sealed itself in an organic shell, protecting the new art from the busy city life, a sanctuary centralized in a grand atrium surrounded by a spiraling path. However, this pure architecture had difficulties in exhibiting art, especially the one that resulted from the artistic break of the sixties. 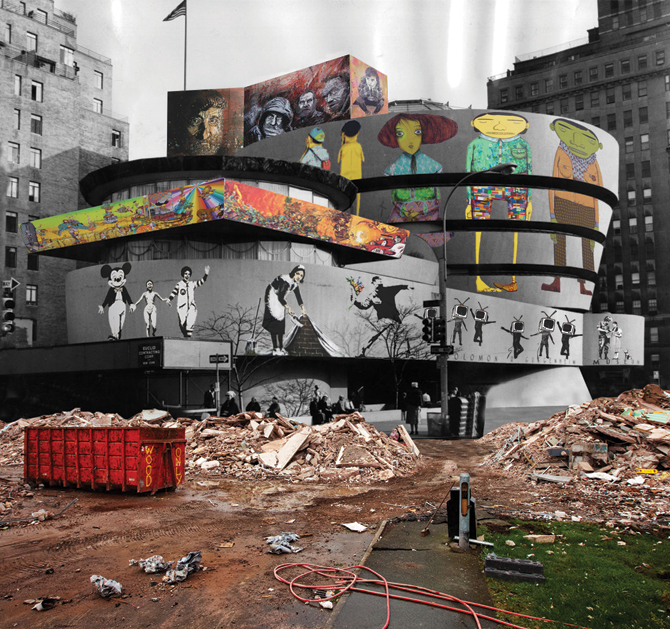 The groundbreaking museum soon became obsolete, exposing only but itself despite the valuable efforts of curators. The truth is that the Guggenheim can recover its revolutionary potential, now as a place for contemporary art, a second breakthrough achieved by a double radical inversion. If art could turn low in high, it should abandon the interior walls and creatively appropriate the exterior façades. In a metropolis that is always destroying and rebuilding itself, in some sort of cannibalism, the emerging avant-garde can fulfill their promise of merging art with life. Aalto believed in a new equilibrium between architecture and nature. Northern empiricism constitutes itself around the Finnish architect and his conviction of a conciliatory traditional and modern landscape. He envisioned an architecture that re-established the bonds between an emerging abstract civilization and a grounded organic culture, an essentially phenomenological approach that gathered ontology, ethics and aesthetics in relation to the specificity of place, a new architecture that responded to ways of being, acquired habits, social practices, established languages, cultural landscapes, local crafts, historic typologies, intentional forms, etc. Aalto anticipated what we can now call a sustainable architecture. Instead of following this contextual path, today sustainability radically challenges this nostalgic and vernacular bias. 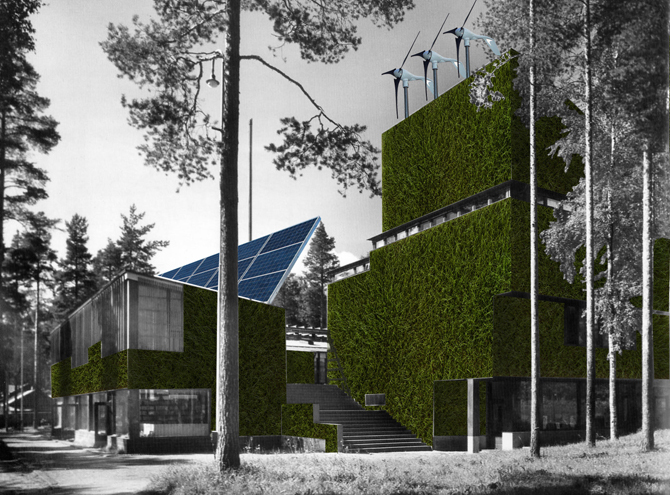 Sustainability becomes the harbinger of a brave new world, a green architecture supported by state-of-the-art technology. Greenery invades the brick façades. Clean energy infrastructure colonizes the existing building. The result is a universally sustainable architecture. Luís Santiago Baptista is an architect and has developed a multifaceted activity encompassing professional practice, academic teaching, architecture criticism, exhibition curatorship and publishing. His research interests cross the fields of urbanism, architecture, design and art, with a main focus on the connection between creative activity and contemporary intellectual, cultural and productive conditions.